The data in this presentation dates to 2009-2011. At that point the median household income in Cambridge was $69,259; it was $130,349 for married couples with children, $92,604 for a single father with children, and $46,809 for a single mother with children. Black or Hispanic residents were more than three times as likely to be living in poverty as White or Asian residents. It’s a short and not very detailed report, but it’s interesting. City Manager’s Agenda #3. Transmitting communication from Richard C. Rossi, City Manager, relative to an appropriation of $2,450,000 from Free Cash to the Public Works Public Investment Fund Extraordinary Expenditures Account for audiovisual upgrades in City buildings, including: the Sullivan Chamber, the Ackermann Room, and Sophie J. Anastos Room in City Hall; the Senior Center Ballroom; the City Hall Annex Community Room; the Lombardi Room at 831 Massachusetts Avenue; the Walter J. Sullivan Water Treatment Plant Lobby at 250 Fresh Pond Parkway; and a portable AV system. The announcement of Chip’s unexpected death on January 13 left many of us stunned. Chip was the Watershed Manager for the Cambridge Water Department who led many public tours at Fresh Pond and in the Cambridge watershed in Weston, Waltham, Lexington, and Lincoln. He was one of the most decent, friendly people you could ever know and Cambridge was so lucky to have him working to protect the Cambridge watershed and educating people about our water supply. My first serious involvement in Cambridge civic affairs came with my appointment to the Mayor’s Water & Sewer Advisory Committee by Mayor Al Vellucci around 1988. Ever since then I’ve maintained a friendly relationship with many of the people who are responsible for Cambridge’s water supply. For some of us, this is not just the death of a respected City employee but also the loss of a friend. There are routine re-filings of zoning petitions that expired during the closing days of the previous Council term. They will now be the first order of business for the new Ordinance Committee whose Chair has not yet been announced. The only thing for sure is that the Chair won’t be Mayor Maher. The mayor sits as an ex-officio member on all City Council committees but is the Chair of none of them. The incentive for this Order is apparently the long-anticipated opening of the H-Mart grocery store which is now finally starting to take shape in the old Harvest Market space. The Order also references the new 10 Essex Street building that will bring another 46 units of much needed houisng to the Central Square area plus ground floor retail (possibly associated with H-Mart). There’s little doubt that the new housing and retail will have some impact on the surrounding area, but these are great new additions to Central Square. It’s not so clear what additional purpose will be served by a traffic and parking study other than to confirm the obvious. These are probably the agenda items that will bring out more public comment than everything else combined. That said, there seem to be a number of assertions made that are not necessarily accurate. For example, the Benzan/Mazen Order #9 states that "Our neighborhoods are in dire need of substantial new space dedicated to mentorship, apprenticeship, scholarship, fabrication, expression, and training related to STEAM (Science, Technology, Engineering, Arts and Mathematics)." When was this conclusion determined? If anything, what has become clear is that there is now passionate advocacy for many goals, and they are not necessarily all compatible. The Toomey Order #10 favors a community arts center. The previous City Council exhibited more than a little sentiment toward use of some of the Foundry space for entreprenuerial/innovation space. There have been numerous instances over the years where political advocacy for "community space" ran well ahead of actual demand. Youth Centers have been built that were not particularly well-utilized. In East Cambridge, the Multicultural Arts Center hasn’t always lived up to its public purpose. One could certainly argue that the latest trend toward STEM and STEAM are really educational functions that should more properly be developed in conjuction with the Cambridge Public Schools (and which may require a range of new employees). Though it’s appreciated seeing both new councillors and long-term councillors jumping in early to address the future of the Foundry issue, it does seem that they are striking the iron before it’s hot. I would respectfully suggest that we should first take a step back and assess what all the unmet demands really are (and not just what some advocates say they are) and what assets the City has to meet these demands. It’s particularly interesting that councillors who bought into the need for a "master plan" for development have not yet expressed any interest in a "master plan" for the many auxiliary services that the City does deliver and should deliver using its variety of school buildings, youth centers, and other facilities, including the Foundry building. I hope I’m not the only one who believes that there’s a need for Councillor Toomey and his colleagues in the State House to tweak the Open Meeting Law to correct for the numerous unintended consequences that it has caused that do harm to collegiality and cooperation among elected officials and with the public. Co-host Susana Segat was out of town for this week’s shows. The City Council successfully elected David Maher as Mayor at its January 6 Inaugural meeting, but now the business of representation begins. The appointment of City Council subcommittees and their Chairs will likely be announced in two weeks, but there’s little doubt that some of the new councillors will try to assert themselves right away. Hopefully the twists and turns of the recent mayoral vote will fade quickly leaving only the spin of the blogosphere. One observation I’ve recently made is that the current City Council committees don’t really match the skill sets of the elected councillors. The City Council and the Mayor should take a serious look at the committee structure and possible merge some of them and invent others to better take advantage of what these 9 councillors may have to offer. Manager’s Agenda #5. Transmitting communication from Richard C. Rossi, City Manager, relative to an update on the new Nexus Study for Incentive Zoning Ordinance. This communication simply informs the Council that the process is underway and that a consultant will soon be hired to conduct the study "to assess the impact of non-residential development on the City’s housing market." … "A nexus study establishes the basis for requiring contributions from commercial developments as set forth in the Incentive Zoning Provisions. The new study will quantify the current impact of new commercial development on housing affordability. Study recommendations could form the basis for changes to the Incentive Zoning Provisions." Manager’s Agenda #9. Transmitting communication from Richard C. Rossi, City Manager, relative to the appropriation of $16,100,824 in funds received from the Massachusetts Water Resources Authority (MWRA) Grant to the Public Works Public Investment Fund Extraordinary Expenditures account for the Alewife Sewer Separation Program. Mr. Rossi states: "This grant will fund the Concord Avenue construction costs, engineering services and final costs associated with the other Alewife area contracts…. The City has been working with the MWRA for over sixteen years executing projects in the Alewife watershed to reduce combined sewer overflows to the Alewife Brook. These improvements are part of the court-ordered cleanup of the Boston Harbor." This is the real measure of a well-managed city – maintaining all of the things that allow a city to smoothly function, especially those things that would not otherwise receive any attention from those who see things only in political terms. Applications & Petitions #3. An application was received from Whittemore Realty Trust requesting permission for three curb cuts at the premises numbered 12A-12B-12C Whittemore Avenue; said petition has received approval from Inspectional Services, Traffic, Parking and Transportation, Historical Commission and Public Works. Chair of neighborhood association disapproves the curb cuts and vice chair of the neighborhood association approves the curb cuts. The entertaining part of this is that the Chair and Vice-Chair are husband and wife, so why wouldn’t they disagree? The ridiculous part is that the response states that "I know of no opposition to the curb cuts. The opposition relates to non curb cut matters." Note to councillors, especially the new guys: The matter before you is a curb cut application. Anything not relating to the curb cut application should affect your vote about as much as your preference in music or beer. Beatrice Davis was the mother of our recent Mayor Henrietta Davis. This is a matter that affects quite a few people who live or work in and around Cambridge. Standards vary widely among the various institutions, departments, and programs. Whether or not the formation of a union is the right approach, there really should be some reasonable minimum standards. If our local universities can sign on to a "sustainability compact" they should also be more than willing to ensure a little economic sustainability among their part-time and adjunct faculty. What exactly is the best way to achieve this is not so obvious, but the sentiment expressed in Council Cheung’s Order is a good one. Communication #7. A communication was received from Tom Stohlman, 19 Channing Street transmitting suggested changes to the Council rules. Communications & Reports from City Officers #1. A communication was received from Donna P. Lopez, City Clerk transmitting the action taken by the Cambridge City Council on an Open Meeting Law Complaint filed by Ilan Levy dated Dec 10, 2013. First, I really don’t understand why Tom Stohlman has chosen to appoint himself "hall monitor" for the Cambridge City Council. The Council rules work reasonably well and I believe there are some adults among our newly elected representatives who can decide how best to conduct their meetings. I actually agree with Mr. Stohlman’s first suggestion that the School Committee and the Mayor might consider a new custom of having the Mayor not necessarily act as Chair of the School Committee (just as the Vice President of the USA does not customarily act as President of the Senate even though this is what the Constitution states). Mr. Stohlman’s second suggestion (that the City Council should discuss who should be Mayor) is now a moot point, though I’m sure that many such discussions took place prior to last week’s mayoral vote. The matter of what the Mayor of Cambridge actually does has been discussed forever by both elected and unelected people. I seriously doubt whether any new revelations will be forthcoming. I’ll not comment on the remaining laundry list of suggestions from Mr. Stohlman. It’s a mixed bag, but I especially don’t care for his later suggestions that would turn every public hearing into a marathon. I’m curious what Mr. Stohlman and his fellow complaint-filing pals might have to say about Order #5. If there were a combined City Council/School Committee Retreat, would it have to be streamed live and a stenographic record kept of all that is said? Finally, I take note of the latest response from the City Council and City Clerk to yet another tiresome complaint. There were, I believe, three such complaints filed during the last term. The first was from Tom Stohlman who disagreed with the City Council’s actions in the choice of City Manager. The only real error there was in the long-standing practice allowing councillors to sign on as co-sponsors on City Council Orders circulated independently by the City Clerk (without discussion). That protocol has now been modified. The second complaint was from Charles Teague who objected to the MIT/Kendall zoning vote long after that matter had been put to bed. The latest (from Ilan Levy) is based only on speculation by the complainant regarding the disposition of the Foundry Building in East Cambridge. Cambridge InsideOut Episode 29 – originally broadcast Tues, Jan 7, 2014 at 5:30pm. Former School Committee member Alice Turkel was the guest (Part 1). Program hosted by Susana Segat and Robert Winters. Cambridge InsideOut Episode 30 – originally broadcast Tues, Jan 7, 2014 at 6:00pm. Former School Committee member Alice Turkel was the guest (Part 2). Play-by-play of the 2014 Mayoral Vote. Program hosted by Susana Segat and Robert Winters. The Inauguration of the 2014-2015 Cambridge City Council will take place today at City Hall beginning at 10:00am. After the ceremonial activities and the oaths of office, there will be just two items of business – the adoption of the Rules for the 2014-2015 City Council (usually just the formal adoption of the rules in effect for the previous Council) and the Election of a Mayor. The meeting will be conducted by City Clerk Donna Lopez until a Mayor is elected. If a Mayor is not elected at the Inaugural Meeting, the most senior member of the City Council, Tim Toomey, will serve as Acting Mayor until such time as a Mayor is elected. There is a relatively good chance that a Mayor will be elected at the Inaugural Meeting this year. The major contenders are rumored to be Leland Cheung, David Maher, and Denise Simmons. If a Mayor is elected, the City Council will then proceed to the election of its Vice Chair (customarily referred to as the Vice Mayor). Later in the day (6:00pm), the 2014-2015 Cambridge School Committee will be inaugurated with the Mayor presiding. It is worth noting that at the end of Ballot #3, Denise Simmons could have once again changed her vote to herself (giving her a majority) but chose not to do so – perhaps due to the belief that this would lead to just another cycle of vote changes. After Mayor Maher took the oath of office, the City Council then proceeded to the vote for Vice Chair. Though not initially unanimous for Dennis Benzan, Denise Simmons moved that the vote be made unanimous and there was no objection. A snow emergency parking ban will go into effect on Thursday, January 2nd at noon. 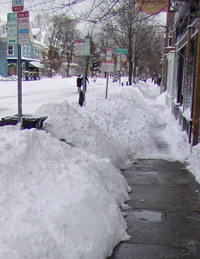 For more information, please visit the City’s website, http://www.cambridgema.gov or call 617-349-4700 or 4800. Beginning at noon, streets that are signed "No Parking during a Snow Emergency" will be ticketed and towed until the ban is lifted. Please check to ensure that your vehicle is not parked on a restricted street. Any power outages should be reported directly to NSTAR at 800-592-2000.
will end on Friday, January 3rd at 5pm.